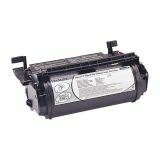 Lexmark 12A5849 High-Yield Toner for Labels, 25000 Page-Yield, Black - Laser print cartridges are specifically designed to assure optimal print quality with crisp, dark output. This print cartridge comes with oiled fuser wipers for customers that do extensive label printing. Optra T print cartridges are designed to work with Optra T printers (T610, T612, T614 and T616 Series) and will not work with other products. Cartridge yields approximately 25,000 pages at 5 percent print coverage. Lexmark Return Program Cartridges are sold at a discount vs. the prices of regular cartridges, in exchange for the customer's agreement to use the cartridge only once and return it only to Lexmark for remanufacturing or recycling.